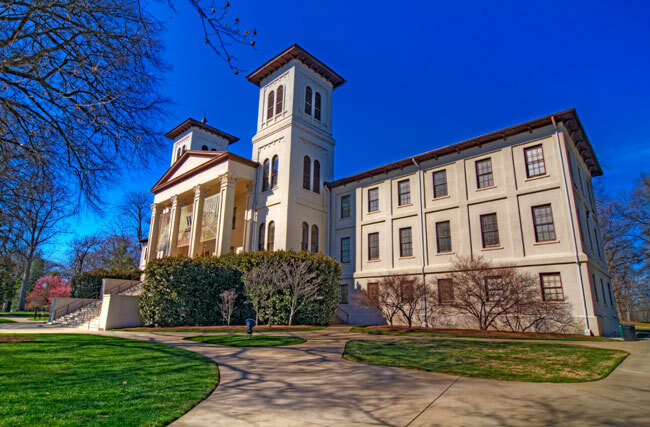 WOFFORD COLLEGE, established in 1854, is an independent liberal arts college located in Spartanburg, S.C. It offers bachelor’s degrees in 26 major fields of study, and is well known for its programs leading to graduate and professional studies (medicine and other health professions, law, commerce, and advanced graduate study across academic disciplines). The college is committed to providing superior students an undergraduate education defined by excellence, engagement and transformation. Wofford is located a few blocks north of the central business district of Spartanburg, S.C., an international commercial center. The college has operated continuously on its original campus, which was designated a National Historic District in 1974. In November 2002, the entire 170-acre campus was designated as the Roger Milliken Arboretum. Nearly 5,000 trees have been planted since 1992.